Houston, Texas, welcomes more than 7 million tourists each year to see the Space Center, the Zoo, or the museums. What patrons won’t see, however, are the stray cats and dogs — an estimated 1.2 million of which live in the metropolis — starving, suffering, and reproducing at an alarming rate. Approximately 400,000 cats and dogs are currently in Houston-area shelters looking for adoptive homes, and this is in addition the million-strong roaming the streets, meaning there is more than one available cat or dog for every two city residents — many of which already have pets. With numbers like this, the problem is not going away any time soon. Within the city limits, it is legal to sell unvaccinated puppies who are not spayed or neutered on street corners, but it is illegal to put out food to keep the existing strays from starving. It sounds as though Houston needs to revisit their animal welfare laws and programs to better serve both pets and people. Groups like Unity for a Solution — a collaboration of Houston-area rescues — are working hard to nip the problem in the bud. Their goal this year is to offer 1,000 free spay and neuter surgeries to low-income pet owners, in addition to visiting local schools and youth groups for humane education lessons. A recent city-wide initiative to provide free spay and neuter services has begun, but with the staggering number of animals, and people, in need of services, access is a continual struggle. A finite number of Houston-area adoptive homes also compounds the problem, because if targeted areas have their strays rounded up, there is simply nowhere for them to go. Corridor Rescue, Inc., a sub-group of Unity for a Solution, has placed dogs in homes as far away as Oregon and Wisconsin, but it is only making a tiny dent in an epic-sized problem. Regardless of income, many of Houston’s residents want to help the city’s strays by feeding, sheltering, and loving needy cats and dogs. But, the challenge continually comes back to the question of further overpopulation prevention. With the average “low-income” dog spay costing around $75, it makes responsible pet ownership unreachable for many of Houston’s low-income citizens. And with mild temperatures year-round, Houston’s dogs and cats are able to successfully breed throughout the winter, making the cycle of overpopulation seemingly endless. 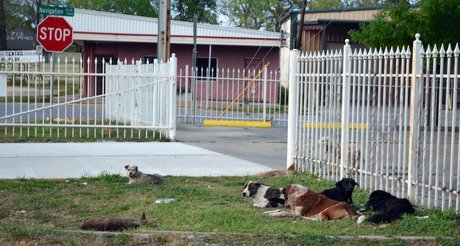 A long-term, comprehensive, city-wide plan needs to be established for Houston to offer high-volume free spay/neuter services for those who need it most, as well as an adoption plan to reduce the number of animals in shelters. Parts of the country such as the Pacific Northwest and New England no longer struggle with stray dogs on every street corner, but it took years of progress, education, and — most important — access to spay and neuter to get there. Houston can get there too, but first, the city and the rest of the country, needs to recognize they have a problem.